We have 3 Technology Education teachers on the writing committee for the new Applied Skills curriculum and they would like your feedback to assist in the final stage of the curriculum writing. I am going to briefly explain what is happening. It is highly recommended that you look up the links below for more details and then we would appreciate any feedback you wish to give once you see the rough drafts of the new curriculum. If you provide feedback please cc info@bctea.org so the BCTEA can follow it. If you have not had a chance to read the BC Education Plan, then we highly recommend you do prior to giving feedback, as the direction ADST is heading follows those guiding principles. 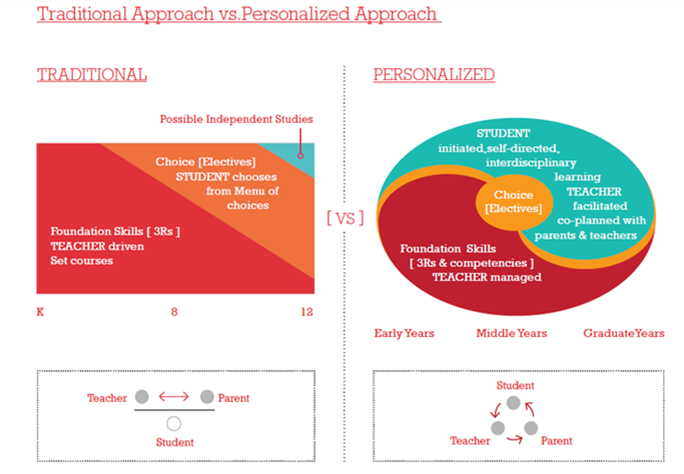 Note in the diagrams, the change from traditional to personalized work in the Choice category. The Ministry of Education is writing new guides for all areas. Technology Education falls under the old umbrella of Applied Skills. The name has been changed to Applied Design, Skills and Technology. It encompasses Business Education, Information Technology, Home Economics and Technology Education. The new curriculum guide is different in that the committee is creating an overarching document that does not specify a shop or specific tools to teach an ADST course. Schools could continue to offer a woodworking course in their wood shop, or they could decide to create a new type of shop that would fulfil the requirements set out in this new curriculum guide. It is very focused on the new education plan initiatives, such as individual pathways and personalized learning. The old IRP’s will still be available as resources, but they will not be updated and will slowly fade away. I am not sure who still uses these IRPs much anymore, as it seems that most Technology Education teachers do what is necessary to provide programs for their school, based on equipment, space and budgetary constraints. Having the four different areas all combined into one document can be challenging, so we have provided a simplified version that only pertains to Technology Education. Our work will be combined with the work from Business Education, Home Economics and Information technology once the writing committee meets again the end of October. What we would like is for you to focus on the areas pertaining to Technology Education. Break through the complicated jargon and let us know what you think is important. The K – 9 is available and you can provide input to these pages. You could print and make your comments on these pages, then pass on to your district rep to speak to at the district reps meeting, bring to the BCTEA conference and drop off there, or scan and send to the BCTEA. The next grade level is the graduation years, 10 -12. The file “Tech Ed Mock Curriculum” has the broad overview. At the top you can see the grade levels listed so we would assume that this would continue to the senior grades. We will need input into the content draft, similar to the file “ADST 6 -9 Content Draft” file shared with you at the top of this page.